Reading Scribe, Alyson Hagy’s slim, dystopian novel, it’s difficult not to hear echoes of Cormac McCarthy’s eerie, early Appalachian writing. Although Hagy has clearly created a work of imagination, she writes with the infused, dark, Scotch-Irish sensibility of someone raised in southwestern Virginia’s Blue Ridge Mountains, as she was, steeped in her farm family’s lore. Scribe is set in a post-apocalyptic, post-civil war landscape, depopulated by fever, impoverished and anarchic. It is without local government or currency, reduced to the crude exchange of goods and services. In language that is both lyrical and hypnotic—sometimes bordering on the elliptical—Hagy tells the story of an unnamed woman, alone in an environment otherwise untethered to a more specific location or time period. Here she clings, fiercely if precariously, to her family’s rural, brick homestead. As the relationship deepens, it takes on a fractious and surreal dimension, bringing back to life the woman’s saintly sister, her death a betrayal, as well as a youthful incarnation of the desperate man, who acts as a guiding spirit. In the final third of the book the action accelerates as danger closes in around them, building to a violent, explosive conclusion. At times, the narrative can be both sketchy and challenging, but well worth the effort. Scribe comes highly recommended, listed as number-one on the Winter 2018–2019 Indie Next List for Reading Groups, compiled by independent booksellers, and touted by the likes of Vanity Fair’s fall preview—all with good cause. 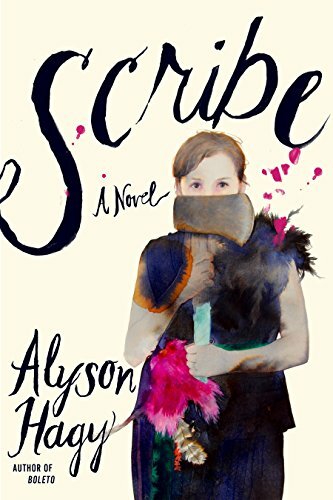 In an interview, Hagy acknowledges that Scribe is “an odd, knotty little book,” inspired by a drive she took to the farm in Job, West Virginia, where her parents now live. Scribe also has a biblical feel to it, which is no coincidence. Scribe is one more, not to be missed. Mark I. Pinsky is the author of Met Her on the Mountain: A Forty-Year Quest to Solve the Appalachian Cold-Case Murder of Nancy Morgan.